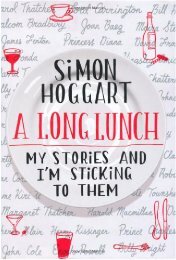 You may already be familiar with the wit of Simon Hoggart through his broadcasting such as Radio 4's 'News Quiz', or his regular Parliamentary sketch and Saturday column in The Guardian newspaper. Well, his fans are in for a treat with his new book. As the son of the academic, Richard Hoggart, author of the seminal work 'The Uses of Literacy', Hoggart's upbringing was bound to be one of opportunity. So 'A Long Lunch' draws on episodes in a rich and varied life that has taken him from Africa, to Ireland, America and other lands in his youth and his subsequent long media career. Add to that his meetings with a wide range of people-in-the-news and you have the makings of a splendid miscellany of vignettes, pen portraits, apercus, delicious scandal and sideways takes on personal experiences, the world of entertainment, politics and personalities. He's never one to blow his own trumpet as his frequent excursions into the gaffs of his early broadcasting career make clear. One such was his first appearance in a television a programme, Face the Press, where such was his nervousness that he obeyed the floor manager's placard instructing the panel chair to wind up the programme. Hoggart, thinking it was for him, promptly did so with the usual formulaic valediction. 'Not you, me, you ####' came he resulting aside from the chairman of the panel, Ludovic Kennedy. (If you want to know the expletive I deleted, read the book!) Result: 'It was some years before I went on television again' (p.92). I particularly relished Hoggart's extensive treatment of the Thatcher phenomenon. According to him, she could show kindliness to individuals, but had difficulty in understanding their thoughts and feelings. If she had a sense of humour, he says it was well hidden (p.190-191) and 'When a double entendre was in the offing, you felt she was certain to utter it' (p.191). There are some hilarious examples of these on p.192. If your interest in politics runs to the likes of Keith Joseph, George Bush, indeed Jeffry Archer (who rates extensive coverage), then there's plenty for you here. That brings me to my rating for the book. I loved it, but accept that the range of subject matter may appeal more to older readers who have clearer memories of some of the personalities and events and who will relish its gentle humour. For Hello! Magazine it is not. I was somewhat taken aback by the abrupt ending, almost in full flow. But these are minor reservations. So I would give the book 8.5/10 taking these minor reservations into account.